This market feels a little different compared to our rally in the fall of 2010. Over the past two weeks earnings thrusts have actually been following through. If this persists, we can look forward to some nice gains. We just need a plan to manage these buggers. For earnings plays use a 5 period exponential moving average as a guide. 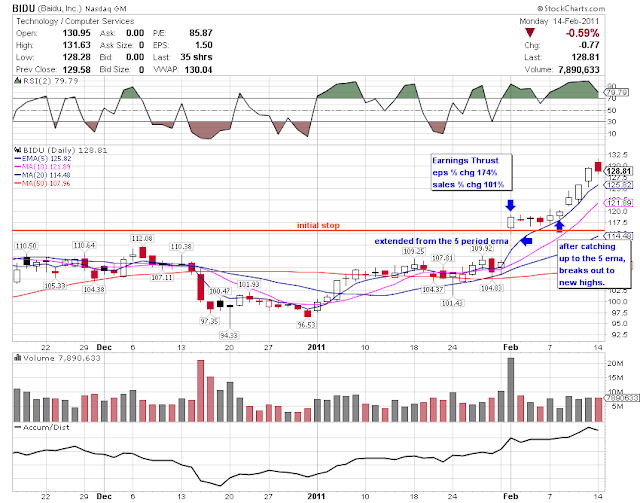 See the chart of BIDU below to see how it would of kept you in from earnings day. BIDU announced superior earnings and raised guidance on Feb 1. The stock was extended from it's 5 period ema after surging almost 10% on the day of the announcement. Use a low of the day for your initial stop. If for some reason the stock reverses you will be covered. The 5 period ema can be used as a visual reference point to gauge if the stock is behaving as expected. Pulling back to the 5 ema would not be unusual after a big thrust on earnings day. After kissing the 5 period ema, BIDU finally breaks out of range. Then we were off to the races. 1. Profit target - wait for the stock to hit your target (10%, 20%, 50%). 2. Moving Average Crossover - Sell if it crosses under the 5, 10 or 20 moving average. 3. Trailing Stop Loss - Use a trailing stop loss of (4% or 8%) depending on how much wiggle room you can handle. By using a moving average as a guide, combined with a sound exit strategy you should be able to successfully manage your next earnings play. No Response to "How to Manage an Earnings Thrust"